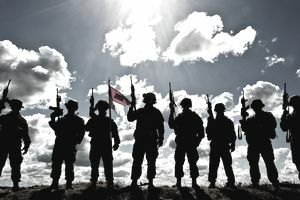 The Army National Guard predates the founding of the nation and a standing military by almost a century and a half -- and is, therefore, the oldest component of the United States armed forces. America's first permanent militia regiments, among the oldest continuing units in history, were organized by the Massachusetts Bay Colony in 1636. Since that time, the Guard has participated in every U.S. conflict from the Pequot War of 1637 to our current deployments in support of Operation Enduring Freedom (Afghanistan) and Operation Iraqi Freedom (Iraq). Today's National Guard is the direct descendant of the militias of the thirteen original English colonies. The first English settlers brought many cultural influences and English military ideas with them. For most of its history, England had no full-time, professional Army. The English had relied on a militia of citizen-soldiers who had an obligation to assist in national defense. The first colonists in Virginia and Massachusetts knew that they had to rely on themselves for their defense. Although the colonists feared the traditional enemies of England, the Spanish, and Dutch, their main threat came from the thousands of native Americans who surrounded them. Initially, relations with the Indians were relatively peaceful, but as the colonists took more and more of the Indians land, war became inevitable. In 1622, Indians massacred nearly one-quarter of the English invaders in Virginia. In 1637, the English in New England went to war against the Pequot Indians of Connecticut. These first Indian wars began a pattern which was to continue on the American frontier for the next 250 years -- a type of warfare that the colonists had not experienced in Europe. By the time of the French and Indian War, which began in 1754, the colonists had been fighting Indians for generations. To augment their forces in North America, the British recruited regiments of "Provincials" from the militia. These colonial regiments brought to the British Army badly-needed skills in frontier warfare. Major Robert Rogers of New Hampshire formed a regiment of "rangers" who performed reconnaissance and conducted long-range raids against the French and their Indian allies. Barely ten years after the end of the French and Indian War, the colonists were at war with the British and the militia was poised to play a crucial role in the revolution. Most of the regiments of the Continental Army, commanded by former militia colonel George Washington, were recruited from the militia. As the war progressed, American commanders learned how to make use of citizen-soldiers to help defeat the British Army. When the fighting moved to the southern states in 1780, successful American generals learned to call out the local militia for specific battles, to augment their full-time Continental troops. At the same time, these Southern militiamen were fighting a brutal civil war with their neighbors loyal to the King. Both the Patriots and Loyalists raised militias, and on both sides, joining the militia was the ultimate test of political loyalty. Americans recognized the important role played by the militia in winning the Revolutionary War. When the nation's founders debated what form the government of the new nation would take, great attention was paid to the institution of the militia. The framers of the Constitution reached a compromise between the opposing point of view of the federalist's and anti-federalists. The Federalists believed in a strong central government and wanted a large standing Army with a militia firmly under control of the Federal government. The anti-federalists believed in the power of the states and small or non-existent regular Army with state controlled militias. The President was given control of all military forces as Commander-in-Chief, but Congress was provided the sole power to raise the taxes to pay for military forces and the right to declare war. In the militia, power was divided between the individual states and the Federal government. The Constitution gave the states the right to appoint officers and supervise training, and the Federal government was granted the authority to impose standards. In 1792, Congress passed a law which remained in effect for 111 years. With a few exceptions, the 1792 law required all males between the ages of 18 to 45 to enroll in the militia. Volunteer companies of men who would buy their uniforms and equipment were also authorized. The Federal government would set standards of organization and provide limited money for weapons and ammunition. Unfortunately, the 1792 law did not require inspections by the Federal government or penalties for non-compliance with the law. As a result, in many states the "enrolled" militia went into a long decline; once-a-year musters were often poorly organized and ineffective. Nevertheless, during the War of 1812, the militia provided the infant republic's main defense against the British invaders. The War of 1812 demonstrated that despite its geographic and political isolation from Europe, the United States still needed to maintain military forces. The militia component of that military force was increasingly filled by the growing number of volunteers (as opposed to mandatory enrollment) militia. Many states began to rely completely on their volunteer units and to spend their limited Federal funds entirely on them. Even in the mostly rural South, these units tended to be an urban phenomenon. Clerks and craftsmen made up most of the force; the officers, usually elected by the members of the unit, were often wealthier men such as lawyers or bankers. As increasing numbers of immigrants began to arrive in the 1840s and 1850s, ethnic units such as the "Irish Jasper Greens" and the German "Steuben Guards" began to spring up. Militia units made up 70% of the U.S. Army that fought the Mexican War in 1846 and 1847. During this first American war fought entirely on foreign soil, there was considerable friction between regular Army officers and militia volunteers, a friction that would reappear during subsequent wars. 'Regulars' were upset when militia officers outranked them and at times complained that the volunteer troops were sloppy and poorly disciplined. But complaints about the militia's fighting abilities declined as they helped win critical battles. The Mexican War set a military pattern which the nation would follow for the next 100 years: the regular officers provided military know-how and leadership; citizen-soldiers provided the bulk of the fighting troops. In terms of the percentage of the male population involved, the Civil War was by far the biggest war in U.S. history. It was also the bloodiest: more Americans died than in both World Wars combined. When the war began in April 1861 at Fort Sumter, both Northern and Southern militia units rushed to join the Army. Both sides thought the war would be short: in the North, the first volunteers were only enlisted for 90 days. After the war's first battle, at Bull Run, it became obvious that the war would be a long one. President Lincoln called for 400,000 volunteers to serve for three years. Many militia regiments returned home, recruited and reorganized, and returned as three-year volunteer regiments. After most of the militia, both North and South were on active duty; each side turned to conscription. The Civil War draft law was based on the legal obligation to serve in the militia, with quotas for each state. Many of the most famous Civil War units, from the 20th Maine which saved the Union line at Gettysburg to Stonewall Jackson's famous brigade of "foot cavalry," were militia units. The largest percentage of Civil War battle streamers are carried by units of the Army National Guard. After the end of the Civil War, the South was under military occupation. Under Reconstruction, a state's right to organize its militia was suspended, to be returned only when that state had an acceptable Republican government. Many African-Americans joined the militia units formed by these governments. The end of Reconstruction in 1877 brought the militia back to white control, but black militia units survived in Alabama, North Carolina, Tennessee, Virginia, and five Northern states. In all sections of the country, the late 19th century was a period of growth for the militia. Labor unrest in the industrializing Northeast and Midwest caused those states to examine their need for a military force. In many states large and elaborate armories, often built to resemble medieval castles, were constructed to house militia units. It was also during this period that many states began to rename their militia "National Guard." The name was first adopted before the Civil War by New York State's militia in honor of the Marquis de Lafayette, hero of the American Revolution, who commanded the "Garde Nationale" in the early days of the French Revolution. In 1898, after the U.S. battleship Maine blew up in the harbor of Havana, Cuba, the U.S. declared war on Spain (Cuba was a Spanish colony). Because it was decided that the President did not have the right to send the National Guard outside the United States, Guard units volunteered as individuals -- but then re-elected their officers and remained together. National Guard units distinguished themselves in the Spanish-American War. The most famous unit of the war was a cavalry unit partly recruited from Texas, New Mexico, and Arizona National Guardsmen, Teddy Roosevelt's "Rough Riders." The real importance of the Spanish-American War was not, however, in Cuba: it was in making the United States a power in the Far East. The U.S. Navy took the Philippines from Spain with little trouble, but the Filipinos wanted independence, and the U.S. had to send troops to hold the islands. Because most of the regular Army was in the Caribbean, three-quarters of the first U.S. troops to fight in the Philippines were from the National Guard. They were the first American troops to fight in Asia and the first to fight a foreign enemy who used classic guerrilla tactics -- tactics which would again be employed against U.S. troops in Vietnam more than 60 years later. Problems during the Spanish-American War demonstrated that if the U.S. was to be an international power, its military was in need of reform. Many politicians and Army officers wanted a much larger full-time Army, but the country had never had a large regular Army in peacetime and was unwilling to pay for it. Further, states-rights advocates in Congress defeated plans for a totally Federal reserve force in favor of reforming the militia, or National Guard. In 1903, a piece of landmark legislation opened the way for increased modernization of, and Federal control over the National Guard. The law provided increased Federal funding, but to obtain it, National Guard units had to reach minimum strengths and be inspected by Regular Army officers. Guardsmen were required to attend 24 drills per year, and five days of annual training, for which they received pay for the first time. In 1916, another act was passed, guaranteeing the state militias' status as the Army's primary reserve force, and requiring that all states rename their militia "National Guard." The National Defense Act of 1916 prescribed qualifications for National Guard officers and allowed them to attend U.S. Army schools; required that each National Guard unit would be inspected and recognized by the War Department, and ordered that National Guard units would be organized like regular Army units. The act also specified that Guardsmen would be paid not just for annual training, but also for their drills. The National Defense Act of 1916 was passed while the Mexican bandit and revolutionary Pancho Villa was raiding the border towns of the Southwest. The entire National Guard was called to active duty by President Woodrow Wilson, and within four months, 158,000 Guardsmen were in place along the Mexican border. Guardsmen stationed on the border in 1916 saw no action. But in the spring of 1917, the U.S. declared war on Germany and entered World War I, and the Guardsmen had a chance to put their training to good use. The National Guard played a major role in World War I. Its units were organized into divisions by state, and those divisions made up 40% of the combat strength of the American Expeditionary Force. Three of the first five U.S. Army divisions to enter combat in World War I was from the National Guard. Further, the highest number of World War I Medals of Honor recipients were from the 30th Division, made up of National Guardsmen from the Carolinas and Tennessee. The years between World Wars I and II were quiet ones for the Army and for the National Guard. The most significant developments occurred in what would become known as the Air National Guard. The National Guard had a few airplanes before World War I, but only two New York aviation units were formally organized. After the war, Army organization charts called for each division to have an observation squadron (the primary mission of aircraft in those days was reconnaissance), and the National Guard was eager to form their own squadrons. By 1930, the National Guard had 19 observation squadrons. The Depression put an end to the activation of new flying units, but several more would be organized just before the U.S. entered World War II. By the summer of 1940, World War II was raging. Much of Europe was in the hands of Nazi Germany. In the fall of 1940, the nation's first peacetime draft was enacted, and the National Guard was called to active duty. The draft and mobilization were to last for only one year, but in September 1941, the term of service for draftees and mobilized Guardsmen was extended. Three months later the Japanese attacked Pearl Harbor, and the U.S. entered World War II. All 18 National Guard divisions all saw combat in World War II and were split between the Pacific and European theaters. National Guardsmen fought from the beginning. Three National Guard units participated in the heroic defense of Bataan in the Philippines before finally surrendering to the Japanese in the spring of 1942. When the U.S. Marines needed reinforcements on Guadalcanal in the autumn of 1942, North Dakota's 164th Infantry became the first large body of U.S. Army troops to fight offensively in World War II. In the European theater, one National Guard division, the 34th from Minnesota, Iowa, and South Dakota was the first to arrive overseas, and among the first into combat, in North Africa. The 34th went on to spend the rest of the war fighting in Italy and claimed more actual combat days than any other World War II division. The years following World War II saw the creation of the U.S. Air Force from what had been the U.S. Army Air Forces. National Guard flying units became part of the new service, creating the Air National Guard. The new reserve component did not have long to wait before its first combat test. The Korean War began in June 1950 when North Korea invaded South Korea. Within two months, the first of 138,600 Army National Guardsmen were mobilized, and National Guard units began arriving in South Korea in January of 1951. By the summer of 1951, a large number of non-divisional engineer and artillery units in Korea were from the National Guard. In November, two National Guard infantry divisions, the 40th from California and the 45th from Oklahoma arrived to fight the North Koreans and Chinese. The 1960's began with a partial mobilization of the National Guard as part of the U.S. response to the Soviet Union's building of the Berlin Wall. Although none left the United States, nearly 45,000 Army Guardsmen spent a year in Active Federal Service. As the decade progressed, President Lyndon Johnson made the fateful political decision not to mobilize the Reserves to fight the Vietnam War but to rely on the draft instead. But when the bombshell of the Viet Cong Tet Offensive struck in 1968, 34 Army National Guard units found themselves alerted for active duty, eight of which served in South Vietnam. Some National Guard units that remained in the U.S. still found themselves on the front lines. As urban riots and then anti-war demonstrations swept parts of the country in the late 1960s, the Guard, in its role as a state militia, was called upon increasingly for riot control duties. For the country as a whole, the 1960's were a period of social change. Those changes were mirrored in the National Guard, particularly in its racial and ethnic composition. Beginning with New Jersey in 1947, the northern states began the process of racially integrating their National Guards. The landmark Civil Rights Act of 1965 forced the Southern states to follow suit, and 25 years later African-Americans made up nearly one-quarter of the Army National Guard. African-American men had a history of militia service stretching back to colonial days; women, regardless of race, did not. Because the Militia Act of 1792 and the National Defense Act of 1916 had referred specifically to "males," it took special legislation to allow women to join. For 15 years the only women in the National Guard were nurses, but in the 1970s, all the armed services began expanding opportunities for women. Following Army and Air Force policies, the National Guard saw its number of women recruits begin a steady rise that continues today. The end of the draft in 1973 ushered in a period of tremendous change for the U.S. military. Cut off from their source of cheap manpower, and under pressure to cut costs, the active services realized they must make better use of their reserve components. The Air Guard had been integrated into the workings of the Air Force since the mid-1950s. By the mid-1970s the "Total Force" policy resulted in more Army National Guard missions, equipment, and training opportunities than ever before. The National Guard shared in the huge defense buildup initiated by President Ronald Reagan. In 1977, the first small Army National Guard detachment had traveled overseas to spend their two weeks of active duty training with regular Army units. Nine years later, the Wisconsin National Guard's 32nd Infantry Brigade was deployed to Germany with all its equipment for the major NATO exercise REFORGER. By the end of the 1980s, Army National Guard units were supplied with the latest weaponry and equipment -- and would soon get a chance to use it. In response to Iraq's invasion of oil-rich Kuwait in August 1990, Operation Desert Storm brought the largest mobilization of the National Guard since the Korean War. More than 60,000 Army Guard personnel were called to active duty for the Gulf War. As the air campaign against Iraq began Operation Desert Storm in January 1991, thousands of Army National Guard men and women, most of them from combat service and combat service support units, were in Southwest Asia, preparing for the ground campaign against the Iraqi forces. Two-thirds of those mobilized would eventually see service in the war's main theater of operations. Occurring soon after the Guard's return from the Arabian Peninsula, hurricanes in Florida and Hawaii and a riot in Los Angeles drew attention to the National Guard's role in its communities. That role has increased as the Guard, active for years in drug interdiction and eradication efforts institutes new and innovative community outreach programs. Since the end of Desert Storm, the National Guard has seen the nature of its Federal mission change, with more frequent call-ups in response to crises in Haiti, Bosnia, Kosovo, and the skies over Iraq. Following the attacks of September 11, 2001, more than 50,000 Guardmembers were called up by both their States and the Federal government to provide security at home and combat terrorism abroad. In the largest and swiftest response to a domestic disaster in history, the Guard deployed more than 50,000 troops in support of the Gulf States following Hurricane Katrina in 2005. Today, tens of thousands of Guardmembers are serving in harm's way in Iraq and Afghanistan, as the National Guard continues its historic dual mission, providing to the states units trained and equipped to protect life and property, while providing to the nation units trained, equipped and ready to defend the United States and its interests, all over the globe.